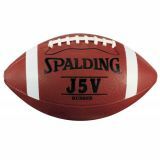 J5V Rubber Full Size Football has rubber cover material, composite laces and natural rubber bladder. 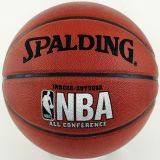 NBA All Conference Basketball has traditional PU composite cover. Official NBA size and weight - designed for indoor and outdoor play. 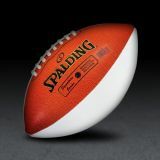 Includes (10) 48" Quick release polyester flags (5 red, 5 yellow), (1) Orange bean bag marker, (8) Orange disks for end zone marking, Mesh Bag with shoulder strap for easy storage. Intramural style clip isideal for league play. Includes (8) 48" hook and loop with nylon flags (4 red, 4 yellow), (1) orange bean bag marker, (8) orange disks for end zone marking, and mesh bag with shoulder strap for easy storage. Performance Composite Cover, 3-ply Liner for strong Shape Retention, Raised Diamond Lace for Improved Grip Control with Tacky Feel, Butyl Bladder for Consistent Air Retention. Pee Wee Size. 6 Football Bag features easy carry handle, two end pouches for extra storage, and removeable individual football compartments. Exclusive Horween S tack Leather Cover for Improved Grip, Raised Diamond Lace for Improved Grip Control with Tacky Feel, Thick Two Ply TPU Bladder for Consistent Air Retention. Full Size. Spiral Panels & Seams Reduce Aerodynamic Frictional Drag by Imparting Rotational Energy Into Extended Spiral Motion of Football. Reinforced Bladder for Air Retention, Ultra Tacky Premium Composite Leather Cover. Great for Training/Recreational Play. Signature Series Autograph Football is made of rubber cover material with machine stitched construction, natural rubber bladder and TPR laces. 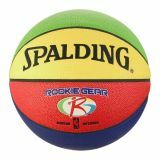 Spalding Basketball, Autograph Signature Series 29.5"
Signature Series 29.5" Autograph Basketball has composite cover, 100% polyester windings and natural rubber bladder.